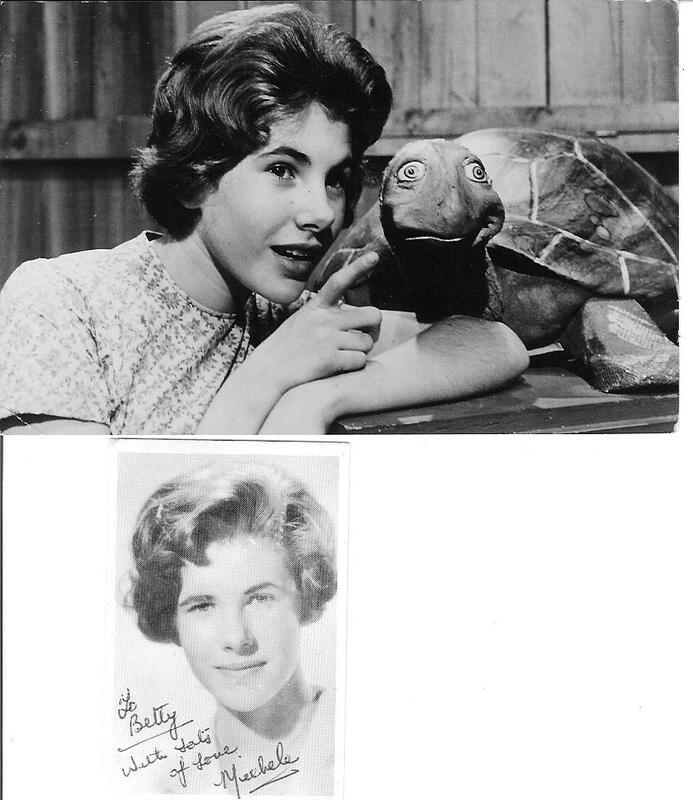 In 1964, a huge slice of my childhood ended when Michele Finney left the CBC kid’s program Razzle Dazzle. 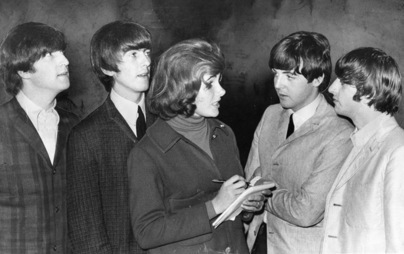 I had been a fan of hers from her earliest days there (1960-61). In fact, we used to correspond regularly. While still living in Windermere in 1962, I got hold of a Toronto phone directory and using a little bit of logic, worked out which Finney listing was under her father’s name. (For those interested, I deduced that the listing in the same WAlnut 7 area as the CBC studios would be it.) One Saturday, I rang the number: a woman answered; I asked to speak to Michele; she said, “Just a minute,” and went and got her! We had a short chat. She claimed to know who I was from our correspondence (I’ll bet she says that to all the boys). Thereafter, I called her about once a month for the next year. 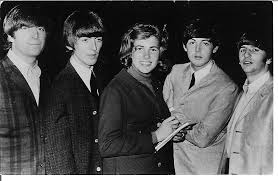 One of my greatest treasures was a photograph of her interviewing the Beatles at Maple Leaf Gardens in Toronto. She’d addressed it to me and signed it on the back. I no longer have any idea of the whereabouts of that photo, but I found a copy on the internet recently. I believe it was in 1965 that Michele returned to Razzle Dazzle for a guest appearance. I had been visiting a school friend (in Barrie) after classes and happened to see the program. As the shows were performed live in those days, I immediately rang the CBC studios in Toronto at the end, and asked to speak to Michele Finney. I was immediately put through to her and we had another of our little chats. That was the last time we spoke on the telephone. For the next few years, we continued to keep in contact, even after I moved to Vancouver and she moved to Alberta. But as with all relationships, time passed and connections get lost. Dec 2016: Michele and I have reconnected on Facebook. This entry was posted in personal, showbusiness and tagged CBC, Finney, Michele, Razzle-Dazzle. Bookmark the permalink. Michele Finney found my blog page about her on Wikinut and left a comment there on my 65th birthday, 9 Feb 2015.. Thanks for the comment. Apart from one movie (in the late 80’s) there are no entries on the IMDB listings, so your guess is as good as mine. Googling her name might yield the odd family reference, but other than her comment on my Wikinut page (now closed), I have had no contact. I still love her Irish beauty, ‘though. This is now my most viewed post. Michelle was a classmate of mine at Rosedale when I spent six months in Toronto in the seventh grade. It’s been a long time since I heard her name, what a gas. It was fun having her in class then seeing her on tv. Hey Chris and Hi! That’s my little photo of Michelle you have up there! Sooo coool!! *Thumbs UP*! Michelle and I were penpals for years (throughout her Razzle years) until she moved to the States. and exhanged warm greetings! Plan to definitely reconnect. So wonderful that she is so lovingly remembered….I most certainly do and always treasured our ”girlie talks” in many many letters over the years. I had a similarly signed photo from Michele during those year: it was lovely to see it on the Internet. We are still friends after all these years (more than 50 now). I’m pleased to know you, too. I also have that same picture! The reason i went looking for Michele today was that i read about the death of Albert Finney. I thought he might have been her father but there was no mention of her. Was she not on another show after Razzle Dazzle? With Peter Kastner? Michele and Albert Finney are not (directly) related.